Too often digital designs collide with real-world applications. What looks great on the computer does not always make a healthy transition onto shirts, banners, business cards and other physically printed materials. Banzai Design is more than just another digital web design firm producing flashy, full-color pieces that look good only on a computer screen. We also have practical, real-world experience in all areas of specialty advertising and in various production areas, such as: screen printing, embroidery, signs, and printing. We speak all the different languages the vendors in these niche industries understand. Banzai will transform your vision and concepts into the final results you expect. Your logo is not just your business. It is your story. It represents the quality of your products and services. It must work properly throughout your business, whether you use it in full color on business cards or in black-and-white on envelopes. It must work whether it is displayed in newspaper advertising or in a television spot. Once your logo is designed, you will want to stick with it for years to come, enabling you to build brand recognition and, with it, your business. 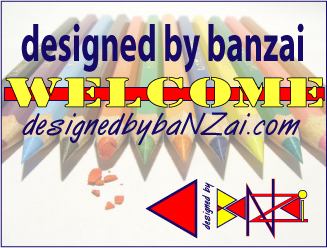 Designed By Banzai works to help build your success, by polishing your brand recognition.